The Polaroid X530 may be the least expensive raw camera on the market, but don't let it's size and price fool you ($149). The camera features RAW image acquisition (unheard of in a point-and-shoot camera) and the revolutionary Foveon image sensor. UPDATE: Sigma has just announced the successor camera to the Polaroid X530. As I mentioned earlier, the Polaroid corporation has been destroyed by corrupt management. The new Sigma DP1 promises to be the best introduction to the revolutionary picture quality of the Foveon image sensor. And it's a RAW camera to boot. I can't wait! UPDATE: After what seems to be months of waiting for a reliable vendor to list Polaroid x530 on Amazon.com, I finally was able to pick one up. The camera is not without quirks, but it takes amazing photos in RAW format. Here's three of mine. (16-bit TIFF). UPDATE: I finally was able find one. As expected, it takes amazing photos in RAW format. Since corporate white collar thieves have systematically gutted Polaroid corporation since the death of the founder, you'll be lucky if you can buy any Polaroid based photography products in 3 years, let alone a groundbreaking camera based on an innovative technology like the Foveon X3. While you're at it, pick up a Polaroid OneStep 600, and you'll be reminded how much fun taking pictures can be - that is, when you leave behind the SD cards, USB cables, ink-jet printers, ink-jet printer cartridges, and computers just to print out a photo to give to your friends. Having trouble printing from your digital camera? Why, didn't they tell you to enable the DHCP on your WIFI printer? If you're looking for a trouble-free camera that is small, easy to hold, and convenient, there are a wide variety of cameras to choose from, including the Nikon S3 ($200-$350) (etc) series, the Casio Exilim ($200-$400) and the Sony Cybershot (Pink; $300-). I will say this: for hurried photographs, anti-shake is a very useful feature. 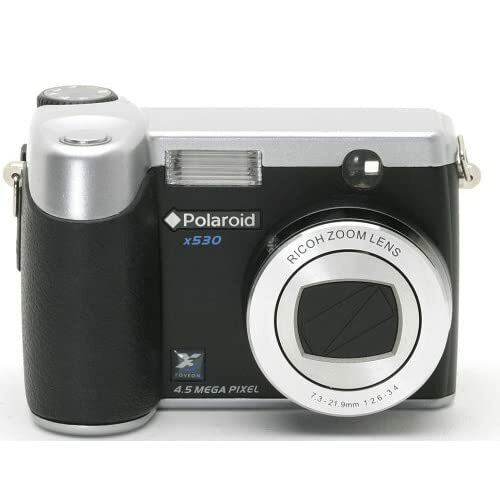 On the other hand, if you're looking to take unbelievable, photographic-quality pictures in RAW format, for just about $100 you can find yourself a Polaroid x530 with the foveon image sensor.